[By Nick] Growing up, I was never a big fan of the "Big 3" in the ice cream world. Vanilla, Chocolate, and Strawberry just never did it for me. 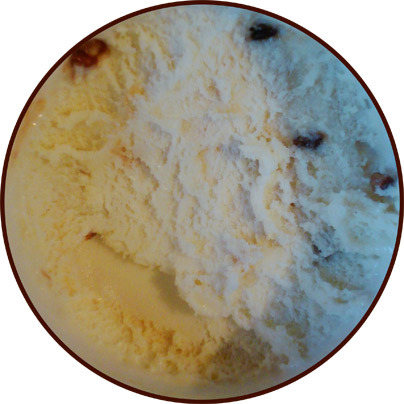 When I had my choice of flavors, I’d always go for Butter Pecan, and not those Vanilla Ice Creams with pecans parading to be Butter Pecan either. I’m talking about the real deal Butter Pecan ice cream. Seeing as I have 2 siblings and I am the youngest, butter pecan was not a flavor I got to have all that often, so when the occasion occurred I truly savored it. Now that I’m older, BP has remained one of my favorites and I can satisfy the craving whenever it strikes. Once I walked by this pint of Blue Bunny’s Caramel Praline Crunch Frozen Yogurt I knew I had to buy it. There’s nothing about that description I do not like. When I was little, I would order Caramel Butter Pecan sundaes all the time. That flavor combination is nothing new to me and I’m happy to see that it’s gone mainstream. Adding praline pecans to the equation can only make things better. 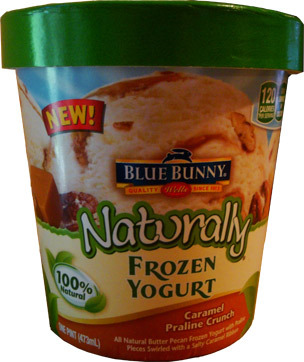 I also love the fact that Blue Bunny has made their froyo line all natural. It’s refreshing to be able to pronounce all the ingredients in a product. Also, with only 120 calories per serving (or if this is really good 480 calories per serving), it’s not going to make me feel like I need to go for a run after. This poor pint has some high standards to live up to and I’m hoping it’ll prevail. Opening this one up, its pretty nondescript. There’s a pecan peeking out but not much else is going on. Sadly, this continues on throughout the pint. The butter pecan base is dead on and is very good all on its own. The frozen yogurt itself is on the soft side and extremely creamy. What I’ve come to notice from Blue Bunny’s revamped froyo line is that there’s a very clean taste to them. What I mean by clean is that it’s almost refreshing and it doesn’t leave any sort of coating in your mouth. It reminds me of a real deal gelato except that it seems to melt a lot faster. 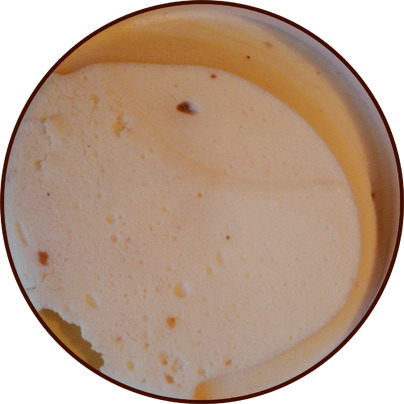 There are a few pecan pieces sporadically placed throughout the pint which lend a touch of added texture. Pecans are a soft nut as it is but I was expecting more of a crunch from them seeing as they are pralines and all. My main problem with this pint is the salty caramel ribbon. Well technically, I’m disappointed in the lack thereof. Now if this was just a butter pecan frozen yogurt I would be content with it but when you say there’s caramel involved then you better deliver on that promise. There were tiny spats of caramel which only added more saltiness and none of the sweetness you associate with caramel. To be honest, if I hadn’t known it was supposed to be there I would’ve thought this was just normal butter pecan with pralines and a bit more salt to it. Now don’t get me wrong, this froyo is still delicious. I easily made my way through about half of the pint. If only that caramel swirl was more reminiscent of actual caramel and not just salt, I could see myself blowing through the whole container. Verdict? A good butter pecan frozen yogurt - The caramel was a lie. Buy Again? For a butter pecan fix, yes. I’ll just have to add my own caramel next time.